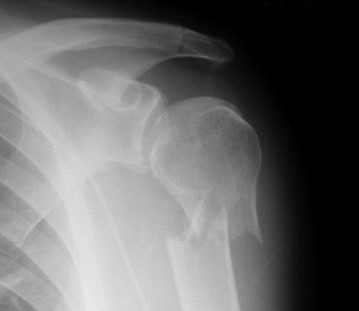 Displaced Proximal Humerus Fractures – To Operate Or Not? Sometimes you may look at a fracture on an x-ray and cringe. It just seems intuitive that an orthopaedic surgeon should do something about it. But as with many things in the field of medicine, what seems intuitive is not always right. For quite some time, many of these fractures have been managed without surgery, but there has been a more recent trend toward operation. Is it the right thing to do? Many patients with this injury are old, with pre-existing medical problems that increase the risk of surgery. A consortium of hospitals in the UK decided to examine this issue with a multi-center trial. They recruited patients from 33 hospitals that could provide either operative or nonoperative management of these fractures. 1250 patients were recruited, and 1000 were excluded. The patients were predominantly elderly (average age 66), and many had comorbidities, insufficient mental capacity, an associated dislocation or clear indication for surgery, or fracture of the other upper extremity. The remaining 250 patients were equally randomized between operative and nonoperative groups. All patients received surgery or a sling, as well as rehabilitation therapy afterwards. After attrition over the 2 year followup period, 114 patients remained in the surgical group and 117 in the nonsurgical group. Overall, they remained well matched. There was no difference in shoulder function or physical well-being between the 2 groups at any time during the 2 years as measured by the Oxford Shoulder Score of the SF-12 Health Survey and the SF-12. Both are self-reported and were administered by a separate examiner. There were 30 complications in the surgical group vs 23 in the nonsurgical group (not significant). One in each group required later surgery. Bottom line: This is a decent randomized study of a specific clinical question. The large exclusion numbers are a little bothersome, but the authors believed that they had adequate statistical power with their final number of patients. Interestingly, a Cochrane review from 2012 showed similar results with self-reported functional scores, but found a significant number of the nonop patients went on to require surgery. But note that the Cochrane review was an analysis of 6 separate studies, which may weaken their conclusions a bit. Ultimately, I think that we don’t have any solid conclusions yet. But given the quality of this study, we should start to seriously question whether patients with this fracture, especially elderly ones, really need operative treatment. Reference: Surgical vs nonsurgical treatment of adults with displaced fractures of the proximal humerus. JAMA 313(10):1037-1047, 2015.